Good Package. 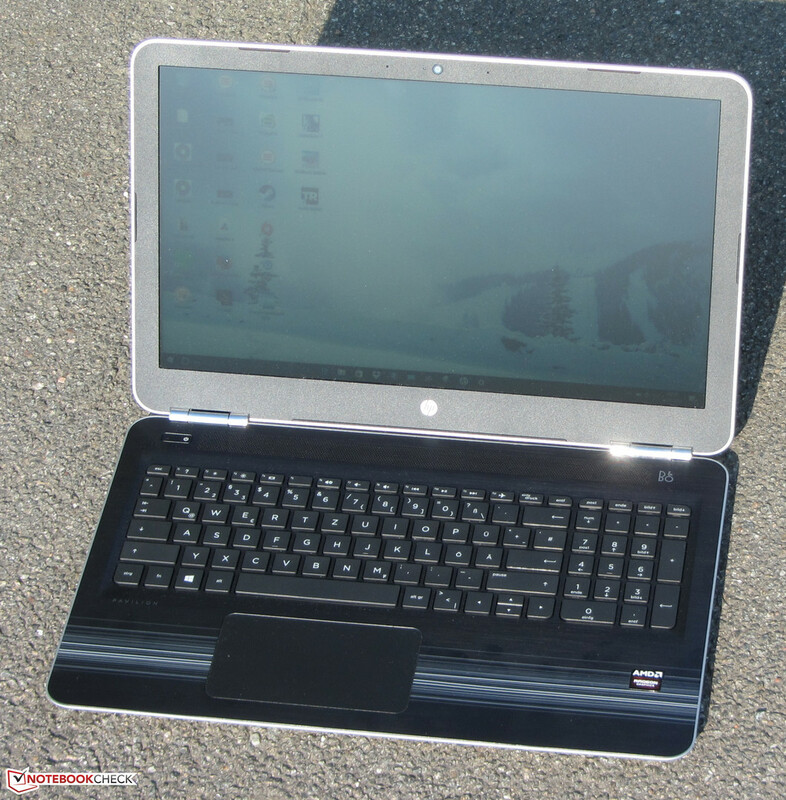 The Hewlett Packard Pavilion 15-aw004ng is an interesting notebook. The 15.6 inch allrounder packs a matte FHD screen, a SSD and an AMD dual graphics setup. The price for all these goodies: 550 Euros. A price like that for a packet like this can convince most buyers to look the other way when faced with certain flaws, such as, below-average battery life and a one year warranty. 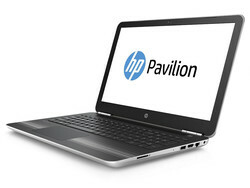 The HP Pavilion 15-aw004ng is a cheap 15.6 inch allrounder. 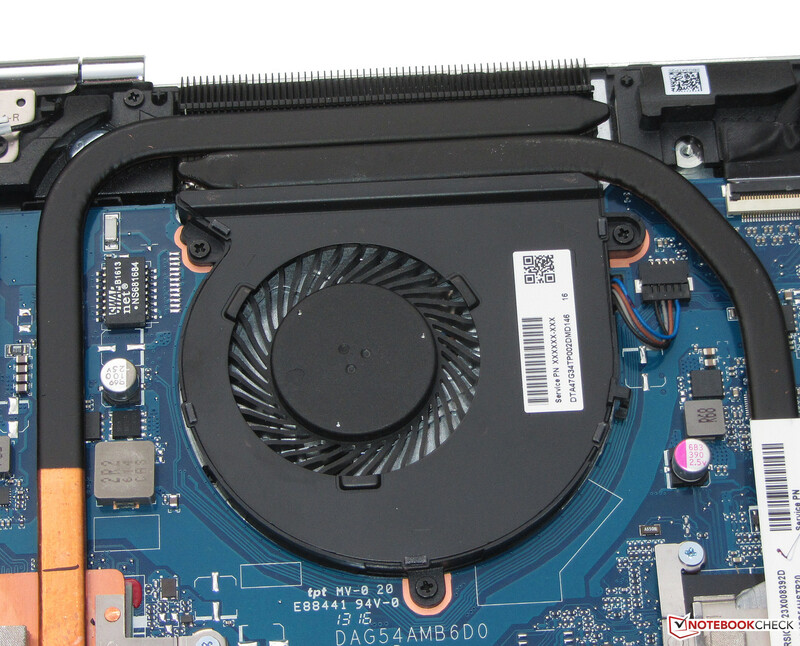 The laptop runs on an AMD APU from the new Bristol Ridge generation, which promises better energy efficiency and CPU Turbo than the Carrizo predecessor. The competition of the Pavilion include the Lenovo Ideapad 500-15ACZ, the Asus F555/X555, the Acer Aspire E5-552G and the Toshiba Satellite L50-C. The Pavilion is quite similar to the Pavilion 15 T9Y85AV. As such, we will not discuss the case, the connectivity, the input devices and the speakers in this review, unless there are differences between the models. For more information on these sections, we recommend taking a look at the review of the Pavilion 15 T9Y85AV. The Pavilion 15 T9Y85AV and our test model use almost identical cases. However, one difference is that the Pavilion 15-aw004ng packs an optical drive. Although the types, number and positioning of the ports available on each laptop are the same, the cases look different. The test model offers a black keyboard, whereas the keys of the T9Y85AV are made of silver synthetic material. The tops of both base units are different, but both laptops remain similar, as they each lack a maintenance flap and have non-removable batteries. The bottom plate of the notebook must be taken off to get at the innnards of this model. The first step in this process requires the user to remove the DVD burner. Afterwards, all screws are taken out from the bottom of the laptop. The rubber strip on the back must also be removed, as it hides a screw underneath. After all screws have been extracted, the user can pry off the bottom panel of the notebook using a thin-edged tool. The card reader of the laptop is quite fast. While copying large data blocks, it offers a max speed of 85.3 MB/s. The transfer of 250 jpg images (each 5 MB) is performed at 57.3 MB/s. We tested the memory card using a reference card (Toshiba Exceria Pro SDXC 64 GB UHS-II). The WLAN module of the test model is a Realtek chip (RTL8723BE), which supports the 802.11b/g/n and fast ac WLAN standards. We tested the device in optimal conditions (no other WLAN devices nearby and notebook placed close to the server PC) and found the transfer speeds to be acceptable, but far slower than the industry average. 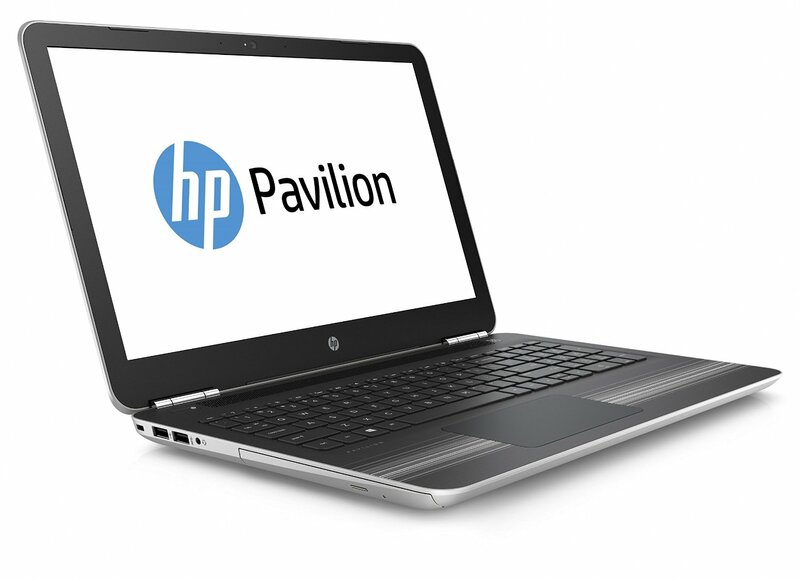 HP has equipped the Pavilion with a matte 15.6 inch display offering a native resolution of 1,920 x 1,080 pixels. The brightness (227.8 cd/m²) and the contrast (490:1) are very low. However, considering the price of this laptop, these flaws are acceptable. Pro: the screen did not show any signs of PWN flickering. 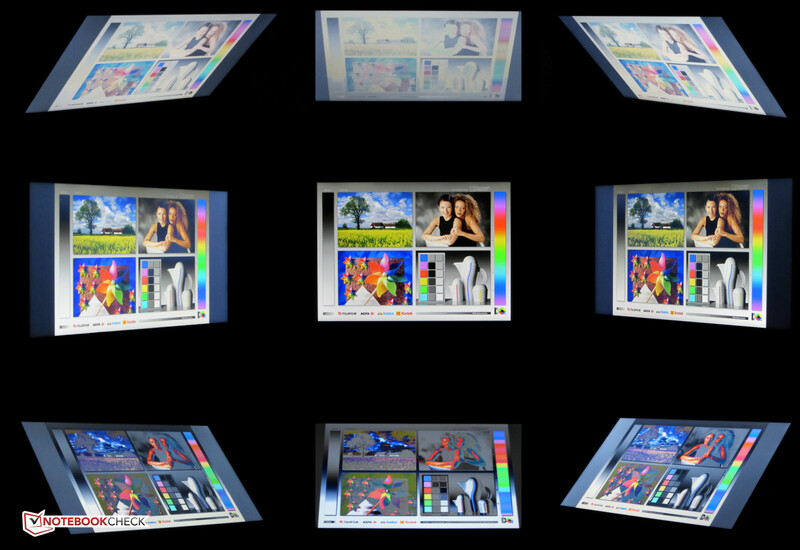 Out of the box, the display has a DeltaE 2000 color deviation of 10.96. The ideal range of a DeltaE lower than 3 is clearly missed. Furthermore, the panel has a distinct blue tinge. 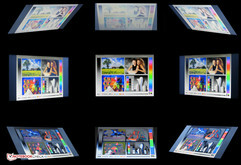 The AdobeRGB and sRGB color spectrums can not be fully covered: 39% (AdobeRGB) and 60% (sRGB) coverage. 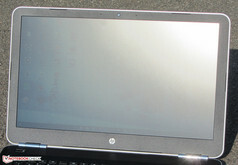 HP has chosen a TN panel for the test model. 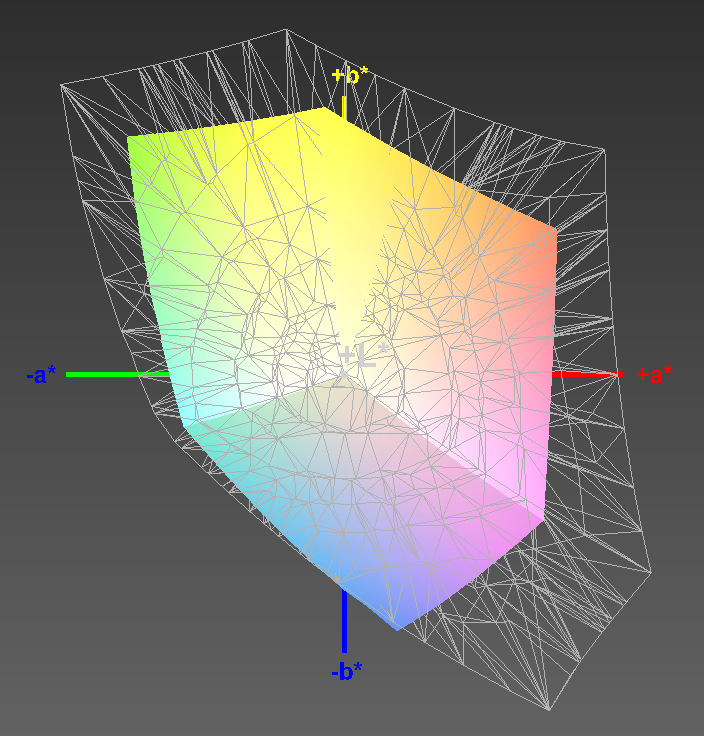 This means that the displayed content is not clearly visible from all viewing angles. 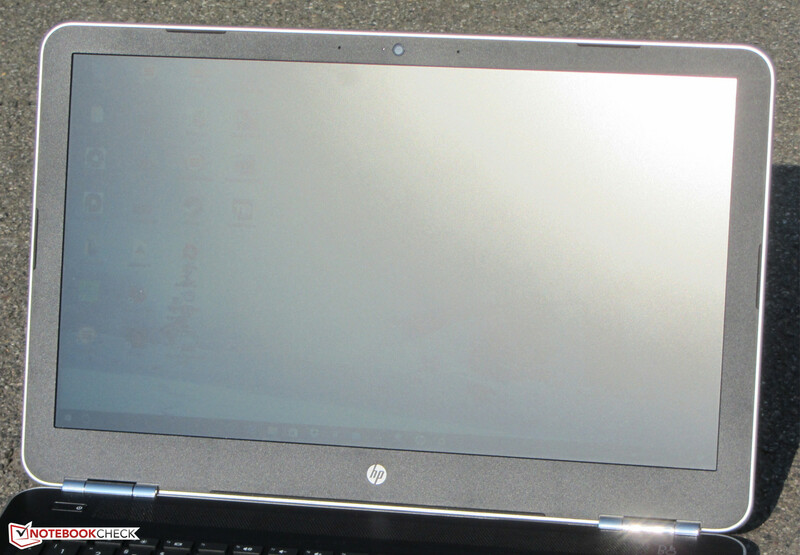 Outdoors, it is quite difficult to use the notebook, as the brightness drops to 139 cd/m² while on battery. The sun is behind the screen. 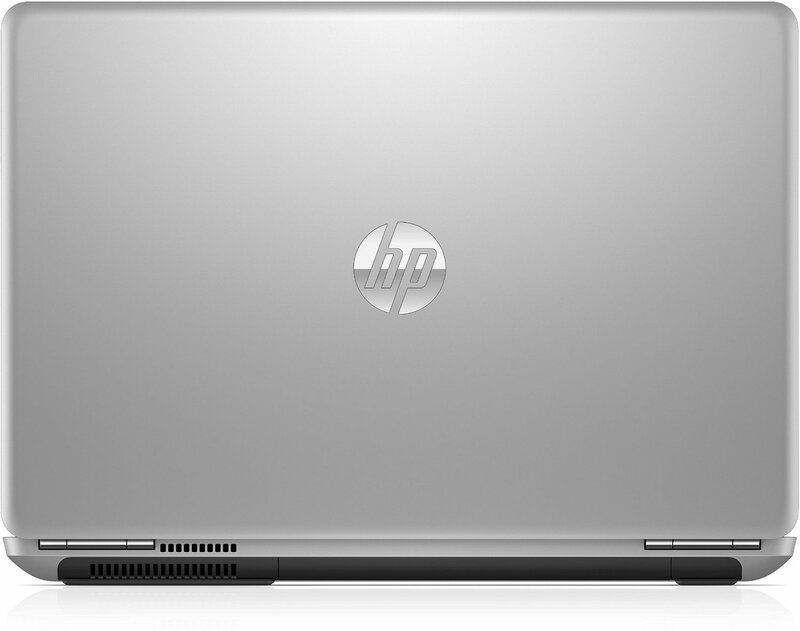 The HP Pavilion 15-aw004ng is definitely a cheap 15.6 inch allrounder, as it packs a CPU capable of handling the workload in most scenarios. Furthermore, the laptop can run games well. Our test configuration was available for 550 Euros and it is possible to find other variations. The Pavilion uses the AMD A10-9600P APU (Bristol Ridge), which is very similar to its predecessor (Carrizo), as AMD has mainly focused on optimizations. As such, the CPU has a stronger and longer Turbo mode, which raises the performance of this APU relative to the Carrizo predecessor. 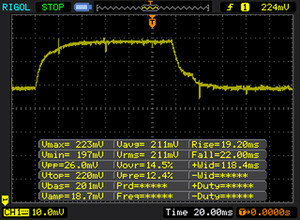 The TDP value of 15 W matches Intel ULV processors. The CPU part of the APU is a quad-core processor, which has a base clock speed of 2.4 GHz. 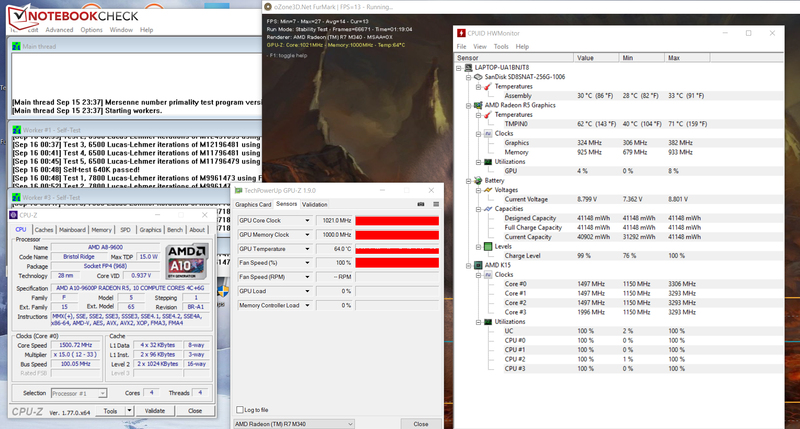 Thanks to Turbo, it is possible for the APU to run at up to 3.3 GHz. 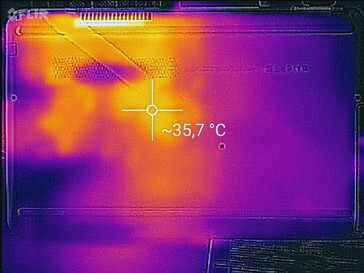 The full Turbo speed is not used much, as in our CPU tests, the processor ran primarily at 2.6 GHz. We rarely saw the speed counter hit 3.3 GHz. The APU is soldered on-board. The system runs smoothly and we did not encounter any issues. The results of the PC Mark benchmarks are very good and it is not possible to increase the performance of the laptop further. 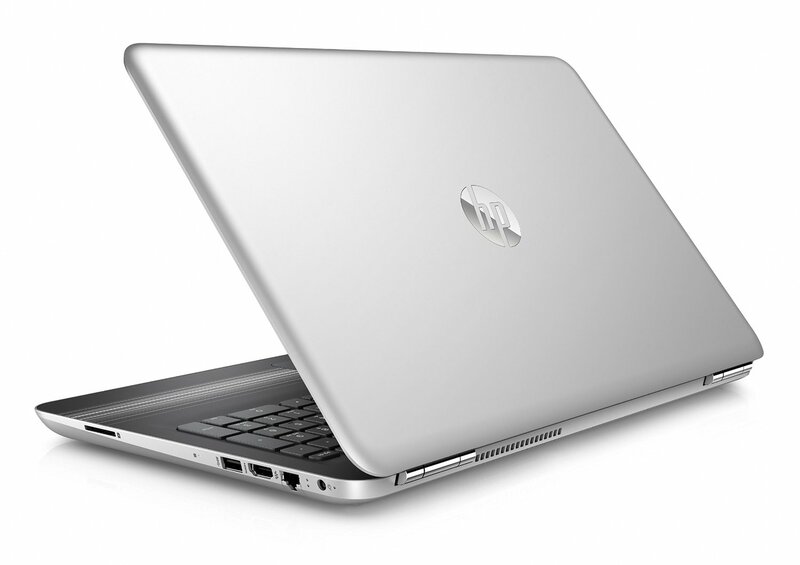 HP has already optimized this model to its limits. The system drive is a SSD from Sandisk. This M.2 drive offers 256 GB of capacity, but a mere 190 GB is free to the user. The rest of the space is occupied by the Windows installation and the Recovery partition. The transfer speeds are good. 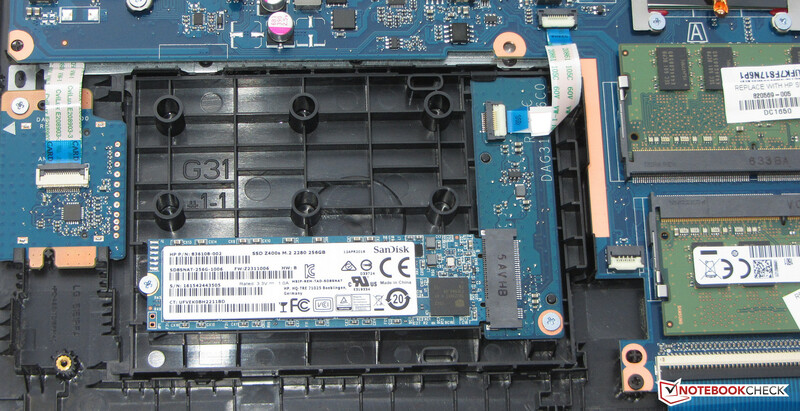 The M.2 SSD could be swapped out for a traditional 2.5 inch hard disk, but a specific cable would be needed (HP Spare Number 856352-001). 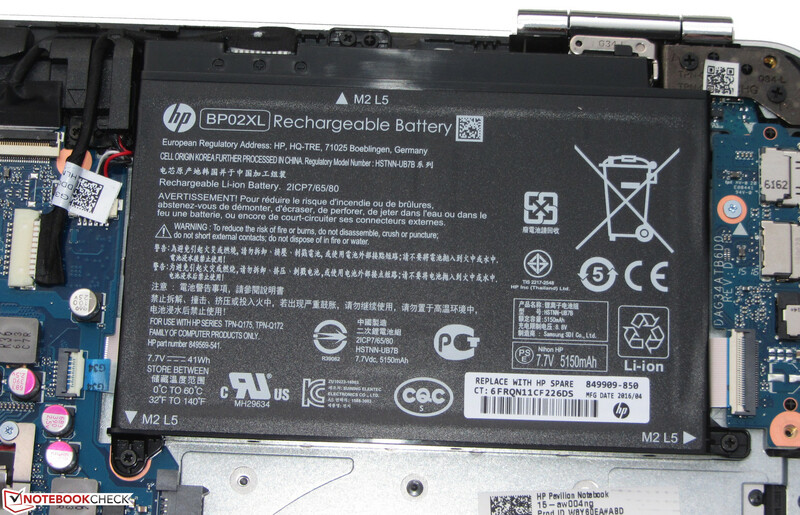 HP uses the M.2-SSD (2280). 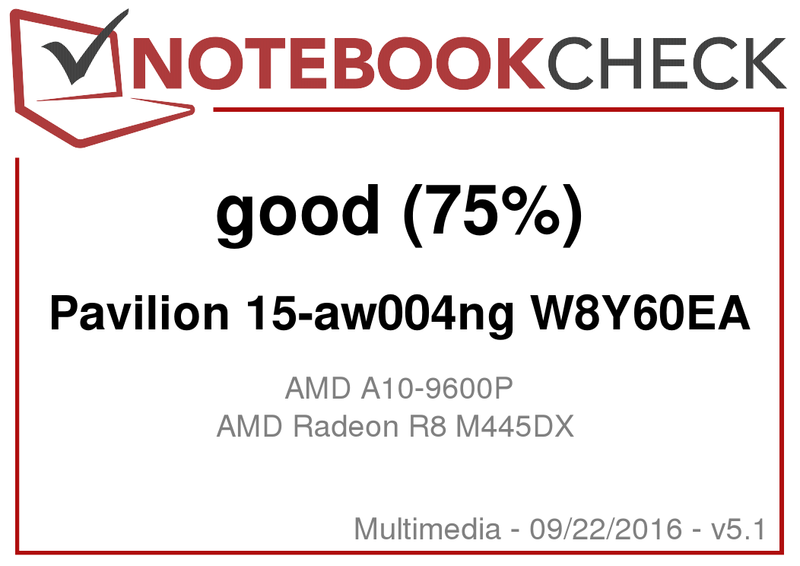 The Pavilion boasts a dual-graphics system from AMD: the Radeon R8 M445DX. 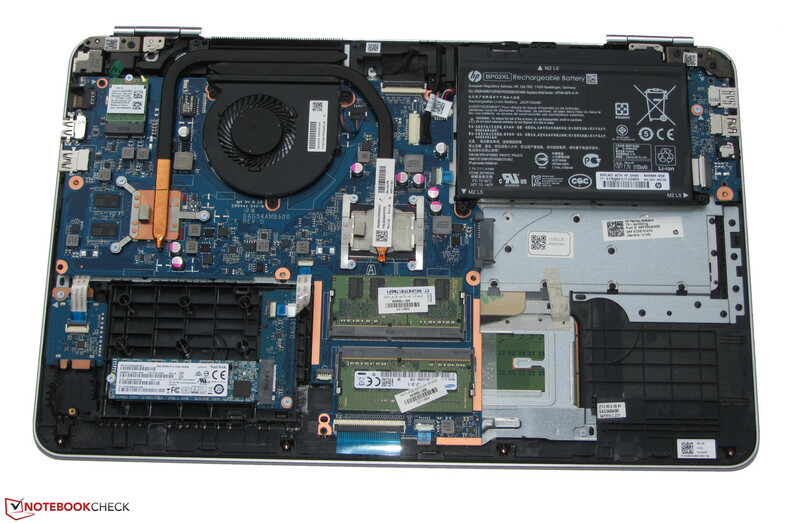 This system uses the Radeon R5 IGP (integrated graphics processor) and the dedicated Radeon R7 M440 GPU. 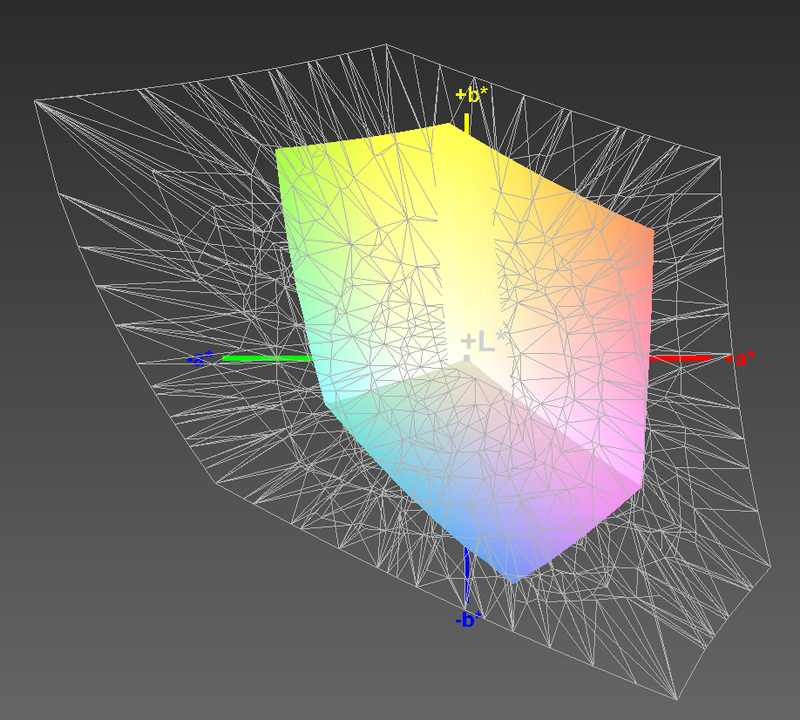 Both GPUs work together in CrossFire mode and take turns crunching frames (Alternate Frame Rendering). This combo scores high points in the 3D Mark benchmarks and the dual-graphics setup from AMD ranks higher than middle-class Nvidia GPUs. The dedicated GPU is soldered. 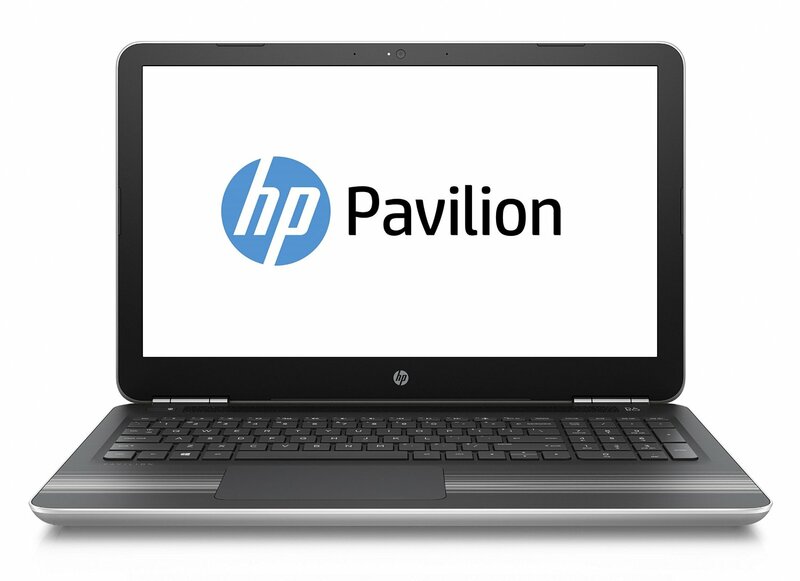 The Pavilion can run games, but if they are hardware-hungry the laptop will run into problems. 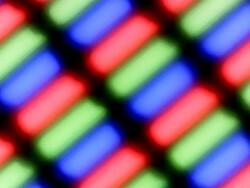 In general, a HD resolution of 1,366 x 768 pixels and low to medium quality settings are possible. 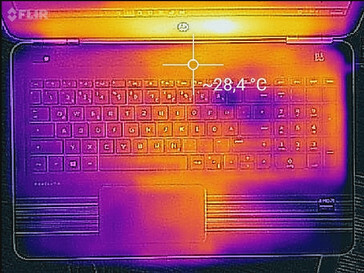 In some cases, it is possible for the laptop to offer more. However, the 2016 games we tested did not run at all. Despite the dual-graphics setup performing better than the Nvidia competition in 3D Mark benchmarks, the Nvidia GPUs have an edge in gaming, as our test GPU falls between the GeForce 920M GPU and the GeForce 930M GPU in terms of in-game performance. The fan of the HP laptop runs at a slow speed while the laptop is idle. 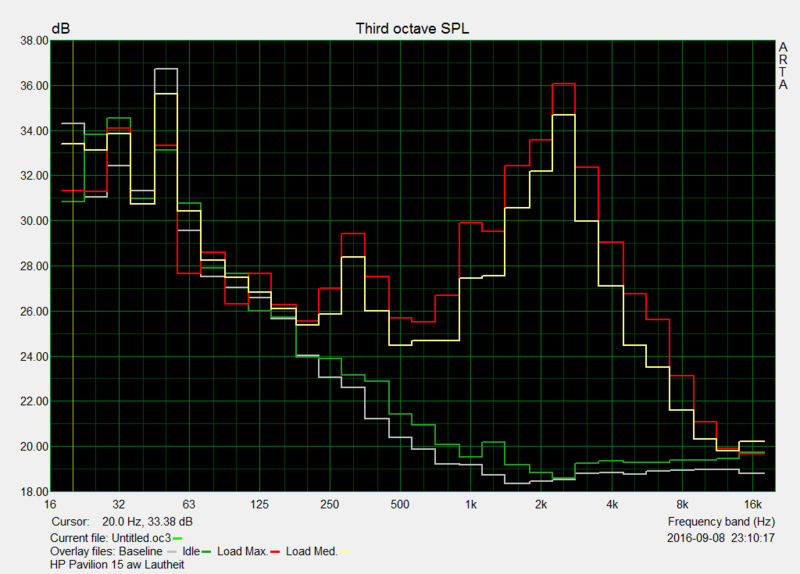 At this level, it is barely audible. The fan is alwas on due to the HP BIOS option "fan always on". Once this option is deactivated, the fan can turn off. At load, the noise emission rise distinctly. Unfortunately, the test model produced an unusual sound: an electric crackling. The intensity of this noise can be adjusted, as Windows "High Performance" mode will make it louder and "Power Saver" or "Balanced" mode will make it quieter. Our stress test involves running Prime95 and Furmark simultaneously for at least a hour. The Pavilion runs this test differently when it is plugged in and on battery. The CPU operates at 1.2 GHz on battery and the dedicated GPU offers 551 MHz. 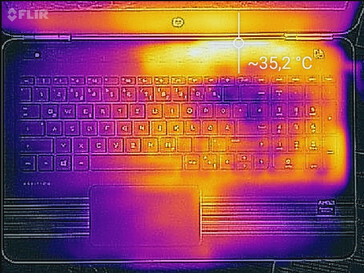 When the laptop is plugged in, the processors offers 1.5 to 2 GHz and the dedicated GPU runs at full power (1,021 MHz). The integrated GPU works in both cases at 320 to 340 MHz. 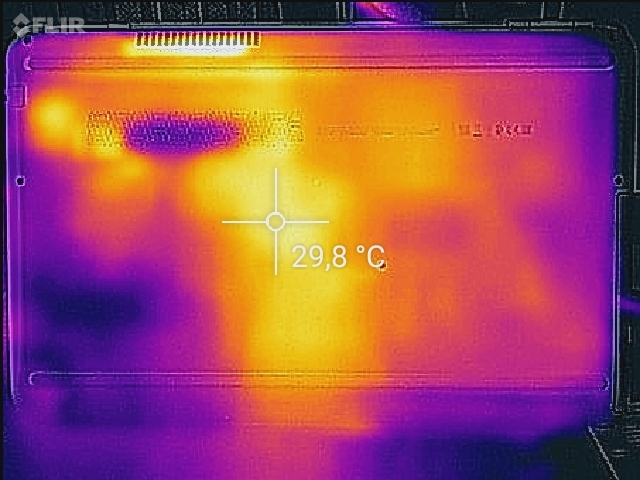 The Pavilion barely gets hot, as all measurement points stayed well below 40 degrees Celsius during the stress test. 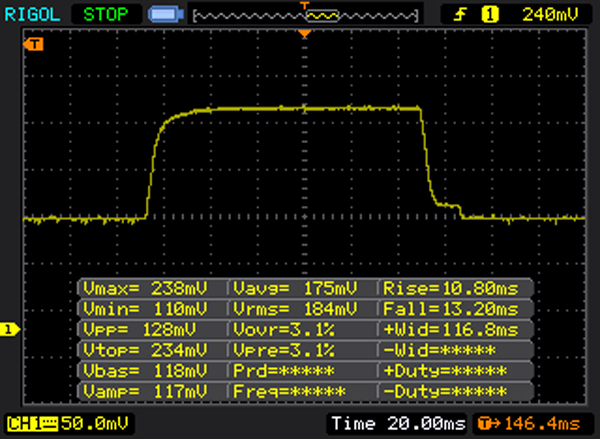 While idle, the laptop needs at most 9.5 W, which is acceptable. During the stress test, this value rises to 58 W. Notebooks, with middle-class GeForce GPUs and Intel processors, can reach similar levels. 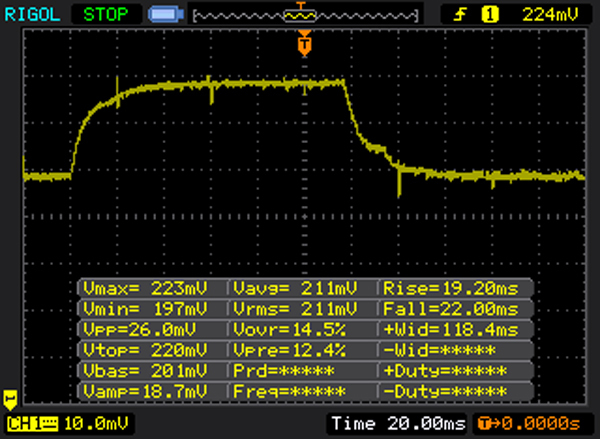 While playing games, our test model needs around 45 W (+/-10 W). The power adapter can cover the needs of our test model, as it packs 65 W.
The Pavilion offers a run time of 4:20 hours in the practical WLAN test. For this test, we simulate the load from surfing websites. 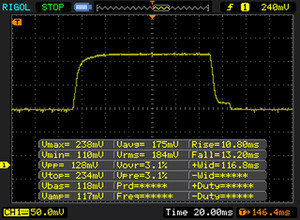 The "Balanced" power profile is turned on, all power saver options are off and the brightness is set to around 150 cd/m². Our video test lasts 3:14 hours. In this test, we let the short movie, Big Buck Bunny (H.264 coding, 1,920 x 1,080 pixels) run in a loop. The wireless modules and power saver options are turned off and brightness is set to 150 cd/m². Sadly, the battery life of this laptop is not very good. A 15.6 inch laptop is expected to run between 5 to 6 hours in our WLAN test. The battery capacity is 41 Wh. The AMD processor of the test model offers sufficient performance for everyday use. Furthermore, the laptop is quite most of the time and it barely heats up. A fast SSD ensures that the system runs smoothly. Sadly, the laptop has no maintenance flap. To swap the SSD, the case must be opened up. The keyboard suffices for home use and the battery life is nothing special. The Pavilion could have been better in these areas. For roughly 550 Euros, the Pavilion 15-aw004ng is a good allrounder for entry-level users. 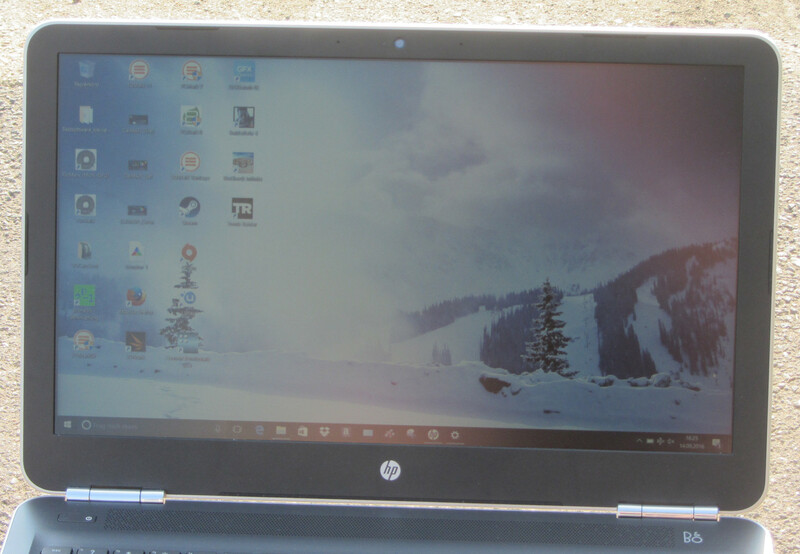 For a relatively low price, HP has included a FHD display and a dual-graphics system. On the other hand, the panel is not very bright and has poor viewing angles and contrast. Additionally, in terms of gaming performance, the dual-graphics system is not as strong as the Nvidia competition. The system itself is covered by a mere 1 year warranty. 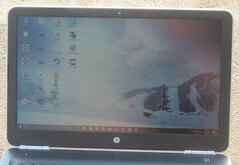 All-in-all, HP offers a low-priced 15.6 inch notebook with clear flaws, which may be suitable for some users.